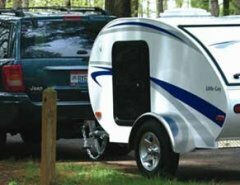 Silver Shadow Teardrop Trailers come in 3 unique models – White Shadow, Silver Shadow and Highline. We show pictures of these – both inside and outside – below. We show the shortest and longest models below – these first pictures are both Highline models. 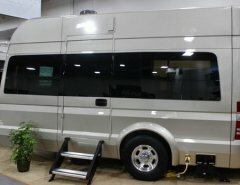 The White Shadow has a fiberglass exterior. The Silver Shadow is constructed with high-gloss, UV resistant Silver Alufiber. The Highline, shown below, gives you your choice of colored walls. The Highline also is available with wide white-wall tires and black fiberglass retro fenders.